Appraisal costs can be kept lower when (a) the appraiser asks the right questions at the right time and works efficiently; (b) clients do or provide things which in other cases the appraiser would have to, (c) clients take steps that enable the appraiser to work more efficiently. All of this rests on the fact that appraisal charges are time charges. IS IT WORTH AN APPRAISAL (AND OF WHAT TYPE)? First and foremost, if we think the type of appraisal you desire for the materials that you have does not justify the costs, we'll tell you and tell you why, and suggest and discuss alternatives. Clarity of the purposes of the appraisal--who will use it and how? Clarity on how detailed an inventory will be essential vs. useful to your purposes; the requirements of third parties (e.g., the IRS, the insurer) are very important but separate matters. Clarity on how detailed the breakdowns of valuation need be for your purposes. Do you need line-item valuation for all books, or perhaps all books valued at $100 or $ 1,000 or more? CERTAINTY: For example, if we are told "there is nothing to be appraised in that room (box, range of bookcases, etc. ), we won't waste time opening, or going into that box, room or range. However: if you're unsure about anything (or unsure about someone else's judgment or if their judgments or identifications or labeling were made for purposes other than that now at hand), it may be best for you to be conservative and check or have us check. INVENTORY: Appraisal costs can be reduced when the client provides a usable inventory. Even a partial inventory can be useful to the appraiser and reduce costs. However, we urge potential clients NOT to start any new inventory process (or lists or calendars, etc.) UNTIL they speak with us. We emphasize this strongly. We'll be happy to share some "wasted effort" stories with you! 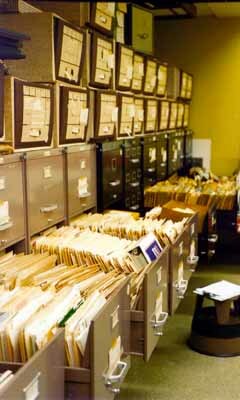 PHYSICAL ORGANIZATION: Appraisal time--and thus costs--can be markedly reduced if the material is easily accessible. Books (or manuscript boxes) on shelves are easier to appraise than those in boxes, or those stacked on tables or, worse, on the floor. But, we urge potential clients NOT to organize or reorganize materials to be appraised UNTIL they talk to us. In general, what appraisers need is easy access rather than any particular organization. We'll be pleased to discuss specifics. PHYSICAL ARRANGEMENTS: One thinks of Hemingway's "...a clean, well-lighted place." Convenient flat surfaces, light, electricity, space to move. The worst case is a storage unit packed nearly full with only 15" wide aisles, and no electricity. However, we've worked in all sorts of places. In one case, the client provided an assistant (already on their payroll) to help move boxes. In another case, a shelf list (available only in card form) was Xeroxed for us in advance of our on-site work. In one appraisal--where an inventory on a database program was available--we asked for printouts using different organization than that which the client used for their purposes. Once we asked client to provide 50 assembled banker's boxes. DO AND DON'T: Please don't reorganize (books, boxes, etc.) during an appraisal-unless you check with us. Please do ask questions and express concerns at any point.